Ed thanks for all your work! You're welcome, thanks for stopping by. Thank you for helping Shay! Now there is proof. I hope some bloggers have egg on their faces for not believing her. Now what is up with the congressional investigation? It seems to have stalled? Hot Damn! I knew when I read Shailey's book she was telling the truth based on my own experiences, her story rang true. Thank you and I hope Shailey is vindicated in every way and the truth about the cover up at APD is told. Thank you for working with Malia and others to get Shay's story out there. I see the other movers and shakers are here too! I hope that this uncovers some of the dirt on the Palins and they lead the investigation all the way to the top. Let them rot in jail with all that accompanies serving time. A loooong time. I will volunteer to write them letters which is my duty as a good Christian. The contents, however, may not be very comforting. I concur in hoping that a lot of people have egg on their face. 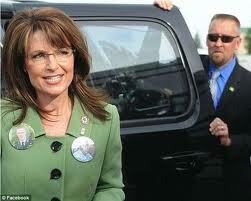 Until she and her ilk go down, I plan to make anything Palin my full time hobby.